CYCLING has become synonymous with Mallorca. From the Tour-de-France-winning Team Sky team, to amateur enthusiasts, the island has become a mecca for lovers of pedal power. C’an Pastilla makes a fine base for riders of all ilk. With an increasing number of bike-friendly hotels, and good access to local cycle routes, riders can strike out across the island. At local bike shop Pearl Izumi Alvaro Arizaleta has seen cycling royalty pass through the doors. “Bradley Wiggins, Chris Froome and the Team Sky team have all been in ,” he says. “We had one of the Sky mechanics in just a few days ago.” Of course, the soaring Mallorca peaks scaled by Britain’s Tour De France winners aren’t for everyone. So the flat, 10-mile bike path which runs through C’an Pastilla has been a huge hit with cyclists of all abilities. 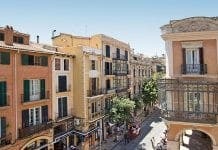 Hugging the scenic coastline, the paseo maritimo stretches from S’Arenal to Palma, gliding past Palma’s cathedral and the Parque del Mar. From here, it strikes east past the former fishing village of Portixol before reaching the sandy expanse of Ciudad Jardin’s beaches. Ride past El Molinar and on to C’an Pastilla, for a gentle journey that cyclists of all ages can navigate. It’s quick, too. “I live in Palma old Town and it take me just 30 minutes to cycle here to C’an Pastilla,” says Alvaro. 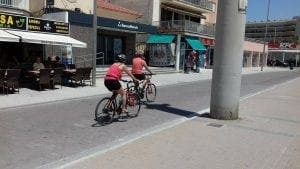 “If some days I have to take my car it is very frustrating as I have to spend time and money parking.” To add to the allure, hotels around C’an Pastilla are becoming increasingly cycle friendly.